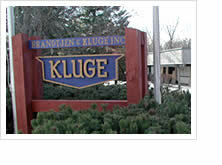 Brandtjen & Kluge, LLC is a US manufacturer of reliable, high-quality print finishing equipment. The Kluge line of equipment includes platen and vertical style foil stamping, embossing and die-cutting presses, multi-function and high-speed straight-line folder-gluer equipment, UV coaters and laser processing and converting. All Kluge equipment comes with approved OSHA and ANSI guarding, installation, training and full warranty. In 1919, Brandtjen and Kluge, LLC was formed as a family-based business. The company spanned four generations over the years during which many developments have taken place keeping up to date with the ever-changing print finishing industry. In 2018, Brandtjen & Kluge, LLC was acquired by Mark Andy, a pioneer to the label and packaging industry. The acquisition builds on the Mark Andy corporate vision of driving profitability in press rooms worldwide through a strategy to be the Total Solutions Partner. While most will recognize the leadership role of Brandtjen & Kluge, LLC in today’s graphic arts finishing industry, the historical roots of the company has fostered many significant developments in the printing industry itself. In 1907, when John Brandtjen convinced two young machinists from Oslo, Norway named Abel and Eneval Kluge to service and install presses for his fledgling printing equipment firm, it is unlikely they could have anticipated the contribution they would make to the printing industry. In fact, it was nearly twelve years later that John Brandtjen’s son, Henry (Sr.), who would often visit his father’s office, would chance upon an innovation that would set a new company in motion. During one such visit, the Kluge brothers had just returned from a press installation in South Dakota. Abel complained that the sticky gum used to feed paper into current presses was in need of constant replacement due to paper lint. The problem was so persistent, Abel said that an operator could feed the paper faster by hand, and he proceeded to demonstrate. with the vacuum process and told the brothers if they could develop the mechanical aspects of the feeder, he could develop the technology to provide the necessary suction to eliminate both hand feeding and the sticky gum. Together the Brandtjen’s and the Kluge brothers developed the world’s first successful automatic feeder for printing presses, and in November of 1919, Brandtjen & Kluge was formed in St. Paul, Minnesota to manufacture and sell the feeder. 1929: Brandtjen & Kluge moves to a three-story building in St. Paul, which would become home for the next 50 years. 1930s: 50 to 60 presses per month are produced and branch offices open in many cities including New York, Los Angeles, Chicago, San Francisco and Detroit. Kluge takes its first venture into the foreign market with exports of Kluge presses to India, the Philippines and Australia. 1931: Brandtjen & Kluge introduces its own 10 X 15 Model “M” and 12 X 18 Model “N” sheet-fed automatic platen printing presses. With speeds of up to 4,000 impressions per hour, improved inking and greater impressional strength, the Kluge Automatics represent another quantum leap for the industry. 1940s: Kluge machines operate on almost every U.S. armed forces base and on many sea-going vessels and warships where they play an important role in wartime communications. 1946: Brandtjen & Kluge develop “MA” and “NA” models. Two years later they’re replaced by the enhanced “MB” and “NB” models. 1948: John Brandtjen passes away and is succeeded by his son Henry, Sr. who serves as president until 1958 when he passes the torch to the third family generation, Henry Brandtjen, Jr.
1958: The last founding members of the company retire. Henry, Sr. in 1958 and Abel Kluge in 1960. The company’s transition to new management is accompanied by a shift in the printing industry. 1959: Brandtjen & Kluge introduces the Model “C” Automatic with a constant speed motor drive system and innovative sealed ball bearings that increases maintenance intervals. This is the forerunner of Kluge’s most popular presses-the 11 X 17 and 13 X 19 “D” Series. 1961: The first Kluge continuous forms press, a modified “D” series machine known as the WFD, debuts. 1963: Brandtjen & Kluge introduces the “HD” a 13 X 19 press to fulfill the strength and capabilities demanded by the emerging foil stamping industry. The new, eye-catching techniques of foil and embossing are gaining acceptance, and Kluge’s new press meets the need with a three-draw leafer, die heating plate and extraordinary impressional strength. 1964: Brandtjen & Kluge is recognized by President Lyndon Johnson’s “E Award” for excellence in developing export markets and contributing to the U.S. economy. 1967: Brandtjen & Kluge fills the demand for an even stronger press with the with the 14 X 22 EHD. 1971: Brandtjen & Kluge receives the “E-Star Award” for excellence in developing export markets and contributing to the U.S. economy. 1982: Brandtjen & Kluge introduces its heaviest and most sophisticated press to date with the Kluge EHE. With over 50 tons of impressional strength, precision positive registration system and Kluge’s patented Delayed Dwell technology, the EHE quickly becomes the leading press in the market for detailed stamping and die-cutting work. 1983: The market demands a way to foil or stamp at higher speeds. Brandtjen & Kluge responds by developing the “WFE” Series press, capable of foil stamping and embossing at speeds of up to 8,000 impressions per hour. 1984: Brandtjen & Kluge senses the need for fan-folded paper as the personal computer revolution takes hold. The RP-155 Paper Process System debuts to produce variable-sized, fan-folded continuous forms from roll stock. 1988: A two-color version of the RP-155 is released that offers single-pass, two-sided “one over one” color printing. 1988: Brandtjen & Kluge introduces the RP-155E. With its extended processor, the RP-155E accommodates intermediate cross-perforation, or lets users run two different perforation lengths without changing cylinders. 1993: Henry Brandtjen, Jr. steps down as president of Brandtjen & Kluge. Hank Brandtjen assumes the leadership of the now 75 year old family-owned company. 1993: Brandtjen & Kluge unveils the VS2028 large-format sheet-fed foil stamping and embossing press. Its heralded by the industry as the next generation of finishing presses. 1994: The Kluge Pack-to-Pack press makes its debut as the most affordable pack-to-pack offset imprinter utilizing a microprocessor registration system. 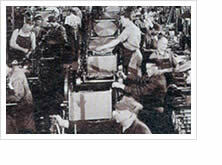 We have found that when a press is the sole responsibility of an individual, it is no surprise that the product is constructed with the highest degree of quality and integrity-levels of which are surpassed only by our workforce’s personal satisfaction in knowing that Kluge presses regularly achieve the highest standards of industry reliability. Kluge presses are carefully finished one at a time, by a single craftsman. Every person who builds Kluge presses is, in essence, an expert at Kluge presses from top to bottom. They know how every part should fit, how every cam should turn. And the parts do fit. Because unlike some other manufacturers, we individually assemble each press from parts machined on our own, state-of-the-art, precision CNC equipment. Finally, at the point that the builder feels comfortable that the machine is complete, it is then turned over to be inspected. Every press is checked, re-checked, tested-and ran. And ran. And ran. The press is then checked again and re-tested before it is crated and shipped. Upon arrival at its destination, Kluge presses are set-up and tested thoroughly by a Kluge technician. The result of this considerable energy is a press that is built to surpass Kluge’s rigid benchmarks of quality-standards of which, after 80 years, we are quite comfortable with. Standards that also seem to give the purchasers of Kluge presses a great deal of comfort as well. It’s this kind of dedication and attention to detail that makes Kluge presses what they are-quite simply the most dependable, most reliable foil stamping/embossing and forms presses manufactured anywhere in the world.